DEBKAfile Exclusive: Presidents Donald Trump and Vladimir Putin joined in their support for Israel’s security at their Helsinki summit on Monday, July 16, after Prime Minister Binyamin Netanyahu told them both that he had withdrawn his objections to the Syrian army reinstating its line of outposts in the Quenitra district, including control of the Ein Zivan-Quneitra border crossing. 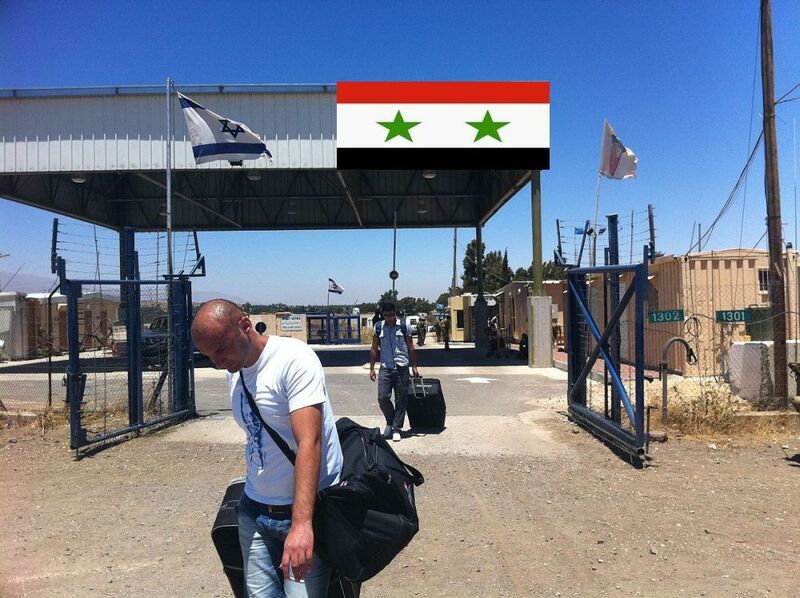 This is the only transit point between Israel and Syria. Our sources reveal that Putin insisted on the Syrian army assuming control of this crossing, in the same way as he stipulated the handover to Syria of the Nassib crossing to Jordan. Monday morning, the Syrian army captured the strategic Tel Al Harrah hills from rebel hands. That line of hilltop positions is the key to controlling the Quneitra district. Our military sources note that only 20 percent of the Syrian army consists of Syrian troops; the other 80 percent are Hizballah and other Shiite militias loyal to Iran. Today’s Syrian and allied victory therefore brings these hostile forces to within 3-4 km from Israel’s Golan border. Is it a fake picture?It seems to be a prison. Its a border crossing, you moron. It’s a crossing with a Syrian flag pasted into the picture as there are no joint crossings!! NETANYAHU SOUNDS AS STUPID (AND COMPROMISED?) LIKE THE DONALD. Its amazing how mass media has millions of people believing utter fiction, such as Trump being a Russian agent, or Israel occupying a country that never existed. Truly amazing, and quite scary. People believe in propaganda to fill the voids in their lives. Yes, this is what frightens me as well… when people become so stupid that they believe anything because they are either too lazy to research and read simple facts or they want to believe in propaganda to fill the voids in their lives. Ok so it’s “your” country. What is the technical name for a country [Greater Israel] in wh. 40% -of the pop. have no civil rights – – the Palestinians – and are subject to military rather than normal civil rule. Straight question. Never met Israeli who could give straight answer. A “protectorate”/ or what? It’s certainly not a normal “democracy”. Israel is the name of our country. It includes all territory between the Jordan river and Med sea. Within our country there is an autonomous Arab region, which exists by virtue of a bilateral agreement signed between Israel & the PLO in 1993. Citizens of the autonomy vote for their own leaders and run their own municipalities. The PLO is free to dismantle their autonomy at any time and demand equal rights as Israeli citizens. Thank you for your opinion Bibi. Thief. The battle of Damascus, still to come.The players are out ready to go.Shame i will not be able to see it. FYI. Jihadists, you love so much, lost Damascus to SAA. I just wander, why people who care about Israel’ safety wants religious fanatics on the border? There was peace and quiet on Golan Heights since 1974 till 2012. Why do you think that will change now? Your article is incorrect. The various Syrian militias are made up mostly of Syrians so about 80-90% of the collective Syrian forces are Syrians not 20% as stated. I have read many times that Iranian advisors / volunteers and Hezbollah are in the north and east of Syria so Israel has nothing to fear. Iran and Hezbollah are in Syria under invitation and their mission is to clean Syria of Whabbie and Salafist Islamists from over 50 countries world wide. Once this is complete then they will depart I suspect. They are doing Israel a favour by maintaining a secular Syria otherwise Israel would have a real Islamist enemy in Syria right on their border. All the campaign by Israel at present to attack Iranian advisors / volunteers and Hezbollah is very very premature. Have patience and cross that bridge after Syria is free of Whabbie and Salafist Islamists. I suggest handing back the Golan to Syria on the condition that no military forces can be stationed there and support this with a UN Security Council Resolution and a treaty with Syria which can be put into their new constitution. This may lead to Syria becoming an friend of Israel. Lol, a friend until the next dictatorship. Hideki Tōjō :my hero,why did not you erase doug and his race? Tojo used incendiary balloons against USA west coast. How did that work out? David is probably correct. Belinda the Bible isn’t clear on when this happens. Also if it happens now it will set off a chain of events that will make your life miserable. you are crazy a should be locked up! Why should Israel hand the Golans to Syria? The Golans belonged to Israel longer than they belonged to Syria. Besides, there is NO internationally recognized document, which states that the Golan heights are inherently Syrian territory. In addition to that, since Syria and Israel never recognized each other as states, there is NO border demarcation between the two countries and therefore there is NO official agreement between the countries, which resolves all the territorial issues between the two countries. So, I am asking again: why the hell should Israel hand the Golan heights to Syria? Then why should Russia return the Crimea? You are either an idiot or have a short memory or have no knowledge of what transpired on the Golan Heights in either 1967 or 1973 – or worst of all, you are all three. I suggest handing back your mother, worn mattress, aching back and all, to her gang-bang group an condition that no Shlinger attempt to enter her, and make that a part of the group rules. This may lead to a cure for your mother’s bow legs. If they are Islamic then they want to eradicate Israel - it is about distorted beliefs. Whenever Islamic armies who are offivislly at war with Israel and have the ststed goal of eliminating Jews and infidels from the fsce of the earth get anywhere near ir withon, it is an existential concern. It makes no difference if those Islamic forces sre ISIS or Helbollah- Iran. The major concern is the latter for the moment because they have a huge Islamic state behind them and a nuclear arsenol. Whenever Islamic armies who are officially at war with Israel and have the stated goal of eliminating Jews and infidels from the face of the earth get anywhere near or within, it is an existential concern. It makes no difference if those Islamic forces are ISIS or Helbollah-Iran. The major concern is the latter for the moment because they have a huge Islamic state behind them with a nuclear arsenal. Naive David. Syrian army lost and dissolved somewhen around 2013. Since then in Syria fight Hezbollah ( 8-10k soldiers), Revolutionary Guards, consisting of Afghans, Pakistanis, Iranians and many other volunteers from around the world. Most probably there are also volunteers from Europe. There is also some 10-20% of Allawi officers in this unholy army. These are supported by russian air force and missiles. air space is protected by russian Ground to air systems, the oldest operated by the abovementioned Allawi officers and advanced operated by Russian. Iranians will never leave Syria if not strongly asked. Strongly asked means systematic destruction of Iranian property in Syria and systematic drain of their resources and routine killing of their soldiers, officers and advisers.. It may take generations if rule of Ayatollahs persist. Lol.Complete sell out.Time will tell.Big words but watch what happens on the ground/air.That’s another story. Israel needs to trust HaShem only. I would never hand anything over to the Syrians or the Russians. All of these troublemakers need to be pushed back away from Israel’s border. Give a little in the Golan and maybe get Ghazza??!! Peace is good, but golan is worth 10 gazas, both tactically and economically. Nabi Yunus: Gaza is the Palestinian State of the future. No one is ready to take responsibility for Gazans, therefore only Gaza area will remain under palestinian Arabs control. As such it is too precious to fall. Hamas will remain in Gaza and Arabs will remain in Gaza. both in Gaza and the Golan. You are for sure off your meds today, . . . there is not a army on the face of the earth that can go against the IDF, . . . man for man, . . . except the US. On second thought, . . . maybe check your turban, . . . might just be wound a bit too tight. Israel should let the Syrian army into Israel to show they’re not racissssss’. Why would I worry about logistics if I were Assad or Iran. they have no power for more war. Land of israel is already free with the blessing of allah. What needs freedom is Iranian Bahai, arabs woman and all other oppressed minorities of the Persian apartheid state. So sick of Israeli leaders surrendering to people threatening to wipe Israel off the map. Attack them savagely and if war breaks out that looks unfavorable to Israel nuke them before they have A chance to nuke us, if any other nation in the world has A problem with Jews defending themselves from people who say they want to kill us and they attack Israel, then deal with them as well, conventionally or unconventional. Iran does not have nukes, Israel is the only country in the middle east with enough nukes to wipe out the Middle East and Europe…….so what are you afraid of ?